Bruce Larkins résumé, including hot links to draft papers and blogs, is now on line. Bruce Larkins War Stories, a study of wars sources and war choice (New York and Bern: Peter Lang Publishers, 2001). The full text is available online [pdf] for non-commercial personal and classroom use. Bruce D. Larkin, Nuclear Designs: Great Britain, France, and China in the Global Governance of Nuclear Arms (New Brunswick, New Jersey: Transaction Publishers, 1996). 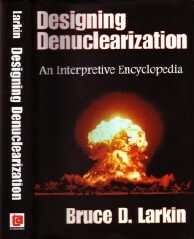 Most recent book: Designing Denuclearization: An Interpretive Encyclopedia (New Brunswick, New Jersey: Transaction Publishers, 2008). The Global Collaborative on Denuclearization Design website at gcdd.net. The directory Denuclearization Links, a guide to Web sources on nuclear weapon programs and nuclear abolition. The complete text of the Acheson-Lilienthal Report [16 March 1946]: Report on the International Control of Atomic Energy. The text of Herbert York's book Race To Oblivion: A Participant's View of the Arms Race , long out of print. Access by chapters or on a single long page [594K]. WaySIGNS: links to selected sites useful for students and scholars [24 February 1999]. 1999.04.13: Kosovo. Kosovo: Is the US bombing of March-April 1999 Sound Policy? A discussion of policy during the Kosovo campaign. 2000.10.13: Abolition Scenarios. Nuclear Weapon Abolition Scenarios. Five plans, from the Acheson-Lilienthal Report to the May 2000 decision of the NPT Review Conference, for nuclear abolition. 2001.05.22: Contrary Maxims. Contrary Maxims: Can We Live With Anarcho-Unilateralism?. In the light of these maxims, the early-2001 Cheney-Rumsfeld moves in security policy are profoundly unsound. [Also available as an html document. 2001.12.20: ABM Treaty Abrogation. Treaty Abrogation and the ABM Treaty. Is a President free to jettison a treaty, without the approval of Congress? 2002.02.01: The Nuclear Posture Review. The U.S. 2002 Nuclear Posture Review and Its Implications for Nuclear Abolition. [Also available as a pdf document]. 2002.10.18: Action Despite GW Bush: Pursuing Nuclear Disarmament in the Face of Sovereign Unilateralism.. In this paper I review evidence of unilateralism in Bush foreign policy and canvass measures which states may take to pursue policies in the global interest. 2002.12.08: Iraq: Go to War? and The Nuclear Question.. [Version 3] Obviously most relevant to the Iraq war question, this paper identifies what I consider to be the key points in public US and UK documents as of mid-October 2002 concerning weapons of mass destruction in Iraq. I isolate the US and UK characterizations of the Iraqi nuclear program and consider 'coercive inspection' proposals. In a section titled WMD Aside, What is the Bush Group After? I put the greatest weight on calculations of electoral success in November 2002 and November 2004. 2003.11.11: The Iraq War of 2003 and the Politics of Denuclearization. This paper traces steps in the decision to go to war against Iraq, showing how claims about Iraqi weapons of mass destruction were knit into US and British justifications. The period surveyed is August 2002 through October 2003. This site is © 1995-2013 Bruce D. Larkin and Helen Kruse Larkin. We can be reached by email.